This person is responsible for getting the work done or making the decision. Try to minimize the number of people in this category for each step. The person with the responsibility for the overall completion. They may not be doing the work, but they are responsible for ensuring it got completed. Should be just a single person. This person is actively engaged and will provide information to inform decisions needed to complete the task. Updated on progress and decisions, these people can be less involved in the planning and decisions, though they may be affected by the outcomes of the work. 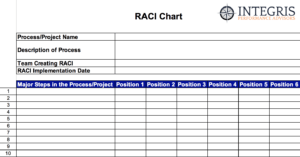 To get started streamlining a process or project download a RACI template.